While it pains me to admit it, it was Chuck Norris who gave me my first glimpse of Vietnam. Films such as Missing in Action would see him navigating the dense forests of Vietnam, miraculously evading landmines, penetrating Vietcong territory to single-handedly rescue old wartime buddies, starving but still very cute Vietnamese children enslaved by cruel communists, and a pretty local girl (probably a third his age) who is likely to show her gratitude in ways not appropriate for this publication. Thus, when fellow writer Susan De Guzman called about an airline seat sale to Ho Chi Minh City (formerly Saigon), I agreed with a degree of apprehension. It was a country I had very little knowledge of save for the violent images on television from watching Chuck or National Geographic specials. I was certain of three things: it was a socialist country; many Americans died there (and they’re still hurting from it); and the Pho (a local noodle soup dish) is awesome. It wasn’t much to go on but even after reading countless web pages and travel guides, I was still unable to latch on to an image of Vietnam that did not involve landmines and forests. I had no choice. I simply had to wait and see for myself. We arrived at Tan Son Nhat airport around midnight. It was quite a modern facility that was efficiently run. Soon enough, we found ourselves cruising down the streets of Ho Chi Minh that, at that hour, appeared to be a cleaner and better maintained version of the older districts of Manila. Even in the dark, we counted many old structures with interesting architectural details. The trip was turning out to be a very promising one. Daylight proved us right. The morning stroll left us straining our necks to see interesting architectural features. Many buildings have been converted to house restaurants and shops, breathing new life into the structure while adding character to the community. Nothing could be more inviting than the aroma of freshly brewed coffee and bread just out of the oven wafting through brightly painted French windows, thrown wide open to entice passersby to stop, choose a charming table outdoors and simply watch the world go by. And I don’t even drink coffee! Some are in a state of disrepair but have managed to retain a sense of dignity from their glory days. They house an odd shop or two, or some small government office where a tired clerk would be going through a messy pile of papers. But a good number left us breathless. Narrow streets crowded with hawkers would suddenly yield a gem. One such was the Ho Chi Minh City Fine Arts Museum. In many ways, it is a tired building, appearing to have seen too many summers that have scarred its facade. But its beauty is unmistakable. This turn-of-the-20th-century building is golden yellow with blue trimmings. It was a former commercial building but felt more like an extremely wealthy person’s mansion with stairs and a foyer greeting guests as they enter. The building is riddled with arched windows adorned with stained glass and balconies bearing intricate ironwork details. It houses sketches, paintings and statues dedicated to Vietnam’s resistance to colonial powers. It also featured various images of Buddha as well as furniture once used by the country’s leaders. It opens into a courtyard littered with sculptures. This level also houses several commercial galleries where one can get acquainted (and purchase) artworks by contemporary artists. Though the roads are quite narrow, it is difficult to feel claustrophobic in Ho Chi Minh because of the many parks placed strategically so that after a few tight streets, the path would suddenly open up to a field of green. And where there is a park, there is likely to be an important building just waiting to be stumbled upon by the intrepid traveler. The park we stumbled into on the second day of our vacation did not disappoint. Just a few meters away was the impressive Saigon Notre Dame Basilica with its twin bell towers piercing the sky with the crosses on their peaks. Vietnam was once a French colony and the European conquerors brought with them their food, architecture and religion. Saigon Notre Dame is a classic example of the last two. The site of the Basilica was once that of a pagoda. It was eventually turned into a church but was deemed too small. A wooden church was built in 1863 but was destroyed by termites. In 1876, a design contest was held. Architect J. Bourad beat 17 other competitors and the resulting structure -- Roman with Gothic elements -- still stand today. There is a statue of the Virgin in front of the Basilica which, in 2005, was said to have shed tears. People flocked to the site, causing traffic in the surrounding streets. And though the church officials declared that the statue did not shed tears, people still came, hoping to see a miracle. It makes for an interesting anecdote about a country often perceived by the rest of the world as having no religious beliefs. Right across the Basilica is another architectural gem. Another remnant of the French colonization, the Central Post Office is a Gothic structure that pays homage to the great names in the world of science. Names of intellectual giants such as Louis Pasteur and Alessandro Volta are carved on the facade which is painted peach-pink with white trim. Inside, a high, arched ceiling looms over a cavernous interior that is richly decorated with many details, making the simple act of mailing a postcard seem like a grand event. The building was designed and constructed by no less than Gustav Eiffel. Nearer to the park is the Reunification Palace (formerly the Independence Hall) -- a massive block of a building standing proudly amidst a sprawling garden. Susan and I immediately had the same thought. It looked like the UP College of Law but much, much larger. The Palace was originally the residence and work place of the President of South Vietnam. When Saigon fell, this was where the war officially ended after North Vietnamese tanks were crashed through its gates in 1975. Vietnam was then unified under the rule of the communist North. Today, visitors can get to see the President’s office, the old war room underneath, and banquet halls where heads of states and esteemed guests are entertained. Tanks and helicopters are also found on the grounds to give guests a better picture of the fateful events in 1975. The real treat, however, is the huge garden wrapped around the palace, a well-tended sea of green that shades strolling visitors from the hot midday sun. It is interesting to note that most guide books call the Reunification Palace the official site of the "fall of Vietnam." For Vietnam’s people, it is the site of a glorious victory which they continue to commemorate. The year 2010 marks the 35th anniversary and at the park right across the palace, we happened upon very colorful posters and banners announcing the event and the ensuing celebration. While much of the rest of the world still mourns for America’s defeat and the loss of South Vietnam, its citizens are happily going about their lives, strolling in parks, planning parades, eating crepes and blissfully unaware of the continuing fuss. It was also for this celebration that a giant tarpaulin featuring the face of the revolutionary Ho Chi Minh (born Nguyen Sinh Cung) greeted us from the facade of the otherwise beautiful Saigon Opera House. The opera house is another fine example of French colonial architecture and all the opulence that the style entails. The facade is shaped like the Petit Palais which was built that same year. Like most Gothic-style structures, the building had so many details and ornate reliefs which, at some point, were removed for being too ostentatious. But everything was properly restored in 1998 for Saigon’s 300th anniversary. I was bitterly disappointed to see the waving Ho Chi Minh covering up so much of the facade. But as luck would have it, we arrived at the end of the celebration and the less-than-pleasing tarpaulins were removed the very next day which allowed us to photograph the opera house without obstructions. At the far end of the road is another massive French colonial building that literally stopped traffic. 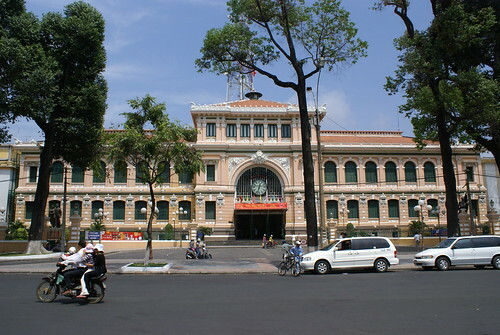 The Ho Chi Minh People’s Committee Head Office (Ho Chi Minh City Hall) was once known as the Hotel De Ville De Saigon. While beautifully illuminated at night, the building is not open to the public and can only be admired from across the street -- at another park where a statue of Ho Chi Minh stands guard. 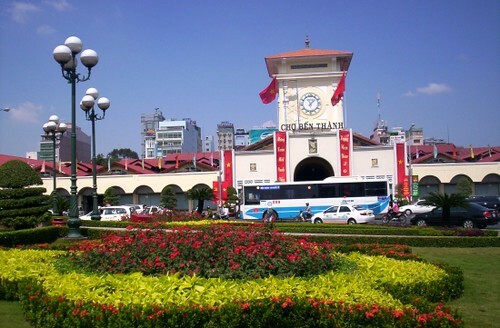 But the best known structure among tourists coming to Ho Chi Minh is one that has attracted visitors since time immemorial for a single reason: trade. Ben Thanh Market, built in 1912, was an improvement on the informal markets found near the Saigon River since the 17th century. Come evening, the building closes to make way for the night market beside it. Divisoria regulars would easily feel at home in this loud, chaotic, and charming retail mecca. Wandering around Ho Chi Minh and gawking at its architectural gems made me wonder about the images I’d seen on television. Were they referring to the same place? 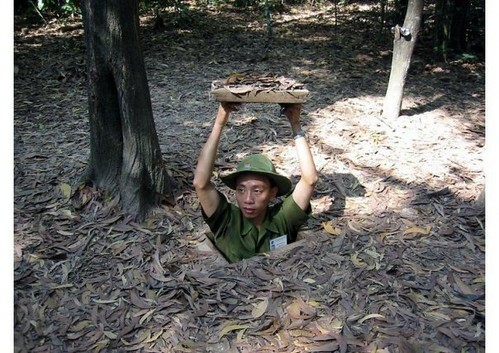 I eventually found Chuck’s Vietnam when we left the city for the infamous Cu Chi Tunnels. Buildings gave way to rice paddies as we got closer and closer to this network of underground tunnels used by the Viet Cong during the war. Our guide led us through thick clusters of trees, one of which held a secret entrance into this underground world. To say the entrance was tiny is an understatement. You have to be thinner than Kim Chiu but no taller than Nora Aunor to be able to fit inside. A hundred meters of this intricate network were enlarged in order to accommodate clueless tourists who end up huffing and puffing after a few meters of crawling inside. Needless to say, my thighs ached badly the next day. And my legs still have a scar or two from deep scratches thanks to the thorns of the thick bushes. But it was an experience to remember, although one I am not likely to repeat. On the way to the tunnels, we stopped at what could possibly be the most colorful temple ever built. The Cao Dai Temple is very difficult to describe. Think of a very oriental looking church that ran smack into a rainbow. Within its walls, one would find Jesus Christ, Buddha and Confucius right next to each other, with several other characters that I failed to recognize. One painting depicted Sun Yat Sen, Victor Hugo and Nguyen Binh Khiem -- collectively known as the Three Saints -- signing a pact between God and humanity. It was all very peaceful. The worshippers were welcoming to visitors and the chanting was very relaxing. Personally, the Cao Dai visit summed up my Ho Chi Minh experience. Different ideas live comfortably side by side. Chuck’s Saigon, National Geographic’s Saigon and the Saigon I visited, though worlds apart, are one and the same. It’s colorful and it never fails to surprise at every corner.